For tourists who wish to travel Tibet, Nepal is the most convenient gateway. It is relatively convenient to travel Tibet from Kathmandu, Nepal as compared to other countries of the world. Nepal Tibet tour package is one of the popular tour packages in Asia. Nepal is a country of diverse landscapes, cultural, rituals, religions, language, and people living in it. The country’s diversity is greater than the countries 3-4 times its size. This makes Nepal heaven for trekkers, cultural tour enthusiasts, nature tour enthusiasts, wildlife tour enthusiasts to name a few. Consequently, secluded Tibet also referred to as the “Roof of The World”. The door of Tibet was flung, open to the tourist since 1984. However, it is still difficult to travel Tibet from other countries of the world. Hence, it remains a secluded destination for the majority of westerners. Tourists entering Tibet will fill like entering into a different part of the world. For some, the highlights of Tibet will be of spiritual nature and for others, it will be an inspiring adventure trip. For tourists, Tibet without a doubt one of the intriguing places to visit in Asia. Tourist can visit fabulous monasteries, commence a high-altitude trek, and glimpse the sight of world highest mountains. Further, tourist will visit one of the most likable peoples here. Tibet travel preparation begins 60 days prior to the Tibet travel date. Tourist will have to search for a best Tibet tour operator in Nepal, confirm the package, and send the scanned copy of passport 60 days prior to the Tibet travel date. This scanned copy of a passport is forwarded to Tibet counterpart from Tibet tour operator in Kathmandu. This is required for preparing the Tibet Travel Permit (TTP). Tourists arrive at the capital of Nepal, Kathmandu to commence the Tibet trip. Upon arrival in Kathmandu, the tourists will have to fill up the Tibet visa. Further with the form they have to submit their original passport for Tibet visa processing. The local Tibet tour operator in Nepal will submit all these documents to the Chinese embassy the next day. Further, it takes two full working days for Tibet visa to be ready. The travel agency submits the Tibet visa along with Tibet permit to the tourist one – day prior to the flight date to Lhasa. The tourist will fly to Lhasa from Kathmandu the following day. The chief goal of the tourist is Lhasa (3,656 meters), the entry port of Tibet. Lhasa is a focal point and spiritual heart of Tibet. The area around Lhasa offers an excellent tour to monasteries. The highlights in Lhasa include the famous Potala Palace, a former residence of Dalai Lama, Jokhang Temple, Drepung and Sera Monastery and Barkhor Market. Please go through the varieties of Nepal Tibet tour package. Please note, all these packages starts and ends at Kathmandu, Nepal. After the tour in Lhasa, another must-visit destination in Tibet package is Shigatse (3,800 meters). Shigatse is 250 km southwest of Lhasa. Shigatse is the second largest town in Tibet. This destination in Tibet has been the seat of the Panchen Lama, traditionally based in Tashilhunpo Monastery. The main highlight of Shigatse is this Tashilhunpo Monastery. Tashilhunpo Monastery is one of the six great Gelugpa (school of Tibetan Buddhism), along with Drepung Monastery, Sera Monastery and Ganden in Lhasa, and Khumbum and Labrang monasteries. From the entrance to this monastery, tourists get a grand view. Above the white monastic quarters is a crowd of ochre buildings (a mix of the Chinese and Indian architecture) topped with gold. Moreover, to the right, lies a great white wall hung with massive, colorful Thangkas during the festivals time. The next stop in Tibet is Gyantse (3,977 meters). Gyantse, Tibet is renowned for the Gyantse Kumbum, the largest Chortens in Tibet. This Chorten is a stupendous tiered architecture that has only two ruined and remote contemporaries on the Buddhist world. At least, two days at Gyantse is worth it if the tourists are interested in making a day trips to less visited monasteries nearby. Furthermore, Gyantse has an archery and horseracing festival in the summer (Best time to travel Tibet). This festival adds a cultural charm in Nepal Tibet tour package. Further, other popular sights are Pelkor Chode Monastery. It was once a complex of 15 monasteries that brought together three different orders of Tibetan Buddhism into one compound. To summarize, the three different orders of Tibet Buddhism are The Three Universal Truths, The Four Noble Truths, and The Noble Eightfold Path. Visit the famous Gyantse Kumbum, the town famous attraction. This sight packed with some exquisite Tibetan mural paintings and rising 35 meters over the four floors surmounted by a gold dome. In addition, the dome rises like a crown over the four sets of eyes gazing serenely to the directions of cardinal points. 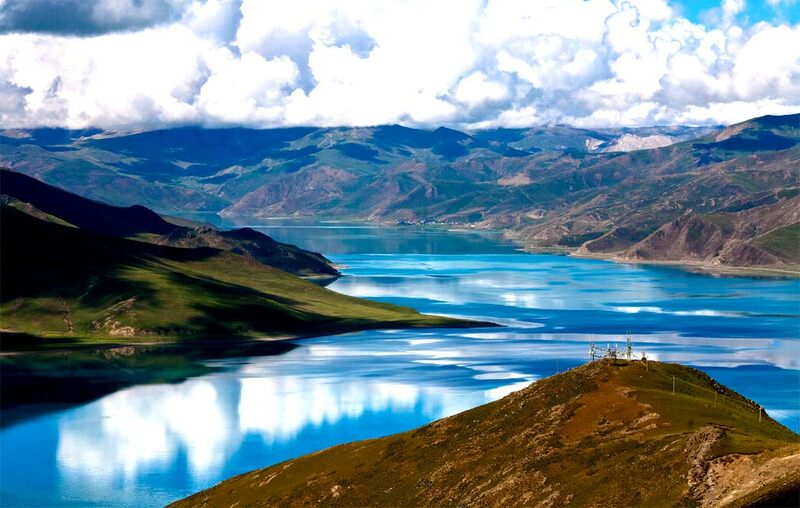 Now tourist will make a detour to Lhasa visiting the famous Yamdrok- Tso Lake. While drive back to Lhasa from Gyantse en route lies dazzling Yamdrol- Tso Lake. Tourist gets the first view of the lake from the summit of Kamba-La (4,794 meters). This lake lies several hundred meters below the road. Far in the distance is the massive Mount Nojin Kangtsang (7,191 meters). This lake is a bending, multi-armed body of water shaped like a scorpion. For Tibetans, it is one of the four holy lakes in Tibet (the others are Nam-Tso Lake, Khamo La- Tse Lake, and Mansarovar Lake). After stopping at Yamdrok – Tso, the drive continues to Lhasa. Finally, after one last night in Lhasa, tourist flies back to Kathmandu to connect their onward fight the next day. Moreover, some of the tourists also spend some days in Nepal enjoying Nepal tour package. Copyright© 2018 - 2019 by Travelsmith Nepal. All Rights Reserved. Powered by: Vertex Web Surf Pvt. Ltd.